We adore this new album. Such depth, light, beauty, gentle passion and joy that gives space for everything within it. 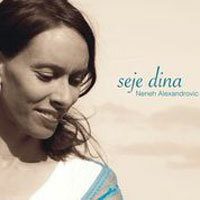 "Seje Dina unites worlds and cultures into unique new sound pictures, a musical journey between heaven and earth and the spaces in between, ancient, playful and gentle at the same time, and brings to our ears what words fail to express. Playful percussion, dreamy accordion, wistful duduk, a deep balmy voice, heart touching violin, groovy guitar, a perfect folk music menu… " We can only agree. "The songs on the CD Seje dina arise from my connection to the original source and are expression of my deep love towards creation. They are a calling for and a remembering of the home in ourselves. The music represent my deepest longing for a united world in which love is the driving force for all being, doing and creating."